I went to Phoenix for ICA in May and visited my friend Brad while there. 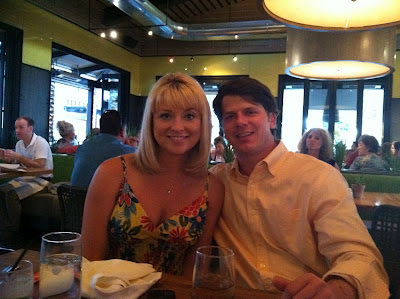 One night we went out to dinner with his family and friends and really enjoyed dining at True Food. The place doesn't take reservations so Brad's brother and sis-in-law arrived early to put our name in. The wait was 40 minutes but the experience was worth it. True Food is popular because the chefs use all sustainable, local produce from partners in Southern California and Phoenix. The kitchen is open concept and it was fun to watch meals being prepared and see all of the fresh ingredients. We certainly didn't see any cans or can openers (at least out in the open). Even the bar was slammed! The cocktail list is incredibly inventive and our table ordered different drinks and all tried sips of each other's bevies. 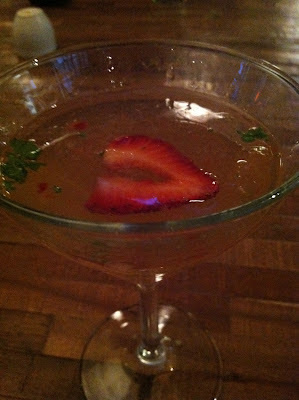 I tried Spontaneous Happiness: Ginger and Vanilla infused Sochu, Thatcher's Elderflower and fresh lime and Retail Therapy: Belvedere Vodka, Grand Marnier, basil and strawberries (picture below). The drink with basil and strawberries was a hit with most of the ladies. The taste combination is amazing! I ordered the Spaghetti Squash Casserole which was baked with fresh mozzarella, organic tomato and zucchini. Brad ordered Red Chili Shrimp: Sesame Noodles, Gai Lan, Spinach and Shiitake Mushrooms. I preferred his dish over mine, even though I adore spaghetti squash. True Food sticks to their goal of providing healthy food so you're not going to find tons of butter in the dishes so the flavor is different than what most of us are used to. Yay for healthy eating! True Food is also decorated in a natural way. These gorgeous planters were all over the place and the bar tenders could actually pick fresh herbs to mix into the cocktails when needed.